When I think about Boogiepop Phantom, I’m also reminded of other recent Madhouse anime, like Shigurui and Casshern Sins. Each has a strange aesthetic; seductive yet tinged by an under-lying sense of sadness and desolation. It would be easy to categorise them as dark and depressing, but they are more complex than that. It’s not horror merely for the sake of mindless chills; it’s horror to serve a purpose, to weave a spell. 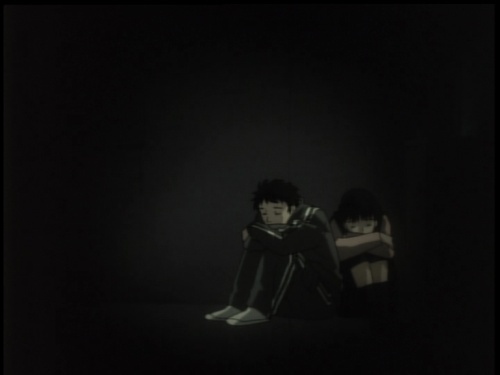 Boogiepop Phantom is disorientating, Shigurui is grotesque and Casshern Sins is desolate, but each conjures an atmosphere potent enough to provoke difficult questions. Their respective characters are often serious and handsome, but lacking in something desperately important; a purpose or a place; sometimes the purpose is twisted and weird, other times the place is empty and lost, but whatever the scenario, it’s always lurking beneath the beautiful veneer; a clash of superficial beauty with something darker and altogether more human, and as a result, a real sense of depth is achieved. The above is from episode 6 of Boogiepop Phantom. It’s such a lovely little analogy I had to transcribe it straight after watching. 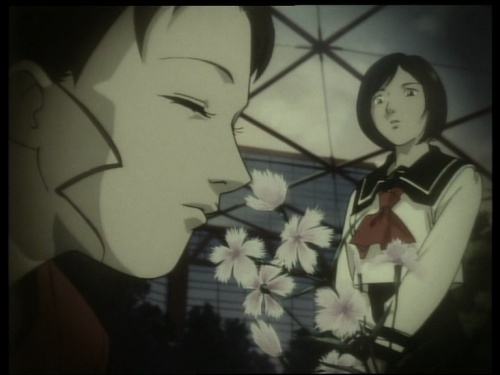 That is so typical of the feeling I get from these so-called “horror” anime, where the eloquence of the prose itself is intertwined with a beautiful piece of symbolism. The scene in-question has a pregnant woman trying to express how she copes with living as a single mother. She’s explaining all this to a girl who hates her own mother for falling in love with another man, despite her father having passed away years previous. I think it’s just a delightfully abstract way of expressing how a mother will always be there for her children. Apparently the books get much more in detail with what’s really going on and the characters. Can anyone explain to me the chronology of the Boogiepop books? I had a quick glace over at Amazon last night but it was all really confusing. Boogiepop and Others is first, then the anime (Phantom), then Vs. Imaginator 1 and 2 then Dawn. Well, I guess Boogiepop at Dawn would technically be first since it’s the origin story but it was published later. I’m not sure if Phantom is considered canon with the novels but I don’t think there’s anything conflicting with it. Man, Boogiepop Phantom’s easily one of my all time favorite anime for reasons already stated, and it’s a shame the rest of the novels probably wont be published in english. I take it the novels are just as good/dark/strange as the anime? I’ve only read Others, and I don’t remember it being nearly as dark as Phantom but it has it’s moments I guess. Most of the deaths I remember seem to happen offscreen, but it’s very character driven like Phantom, but most of the characters actually stick around for a little while instead of being relegated to just an episode. The translator of the novels Andrew Cunningham has a blog where he occasionally talks about the novels and probably goes more in depth more then I ever could. His blog is http://theeasternstandard.blogspot.com and you can find more info under the tags Boogiepop and Kouhei Kadano. Sorry, I just got through writing a long overdue english essay and I’m kind of tired and have a bad headache. Some other quick notes: http://www.sevenseasentertainment.com/series/boogiepop/ gives a pretty good rundown of the series, but it also contains a bit of spoilers from page 3 and onward about some of the untranslated novels, so maybe save it for later. Also, I could’ve sworn Del Rey was going to release the Beat’s Discipline novels set in the same universe, but it turns out it’s a different book from the same author, though apparently most of his works tie in to each other some how so I don’t know if this one does or not.